FFL/Fully Certified GunsmithShip In Your Gun To Us! Born and raised in the mid-west. I have been hunting since I could hold a firearm. Hunting has always been my passion and played a huge role in my life. When I am not fixing firearms I am hunting whenever and wherever possible. I started out my career as a machinist. Working in a machine shop one day I realized that this is not what I really wanted. My Dad, always full of good advice, decided for me… gunsmith school. Tying my passion & machinist skills, into a career was a perfect fit. Since graduating from Colorado School of Trades in Gunsmithing in 2003 I have worked on firearms from all over the world and I have been fortunate enough to work on 1000s of firearms in every caliber, brand, and vintage. My wife Brook and I got our start in Arizona where some of the world’s largest gun enthusiasts are and where we have experienced some of the best hunting in our lives. In 2010 we decided to relocate back to Wisconsin where we grew up to establish our business. 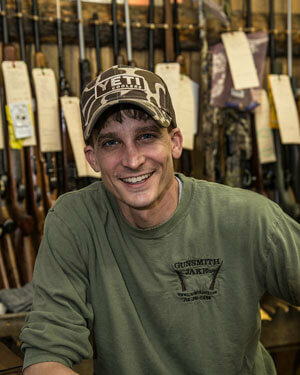 Our shop is a welcoming place for all sportsmen to hang out and improve their firearms. Please come on in and check us out. Send us anything, your problems, your requests for a better shooting/better looking firearm, or your fixer upper. If it is worth it to you it is worth it to us. I can cater to you. If you have any questions about what I can or can't do please do not hesitate to ask. Thank you for checking us out. I look forward to meeting and working with you.